Want to find resources, make a shelter, craft tools, armor, and weapons, and protect yourself from monsters with Minecraft recipes? You've come to the right place! In a handy, portable edition that's packed with step-by-step instructions, Minecraft Recipes For Dummies makes it easy to look up the required items and figure out which blocks you need to gather to create each item. You'll get recipes for weapons, armor, transportation, mechanism, food, dye, wool, and brewing, as well as information on enchanting, repairing, gathering, farming, efficiency, and more. Minecraft is more than just a game: it's an obsession. It has gone from an obscure game with a cult-like following to a mainstream phenomenon. Minecraft consists of players using an avatar to create or destroy various types of blocks, form fantastic structures, create artwork, and much more, all in a three-dimensional environment and across various multiplayer servers in multiple game modes. With this fun and friendly guide, you'll get quick and easy access to Minecraft recipes to enhance your game and get even more out of this popular, addictive game. 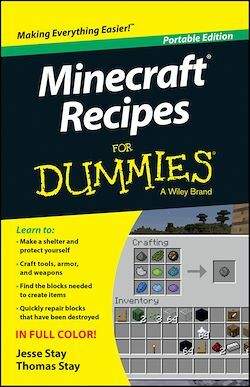 Minecraft Recipes For Dummies is the portable guide that goes where you go as you create a world you'll never want to leave.